If there is one thing that every home has it's a mirror! Can you even start to imagine life without one? Splashbacks of Distinction manufacture, supply and fit bespoke mirrors in a wide range of shapes, sizes and styles. We are confident that we can produce the perfect mirror for any part of your home or office. One of the great things about having a bespoke mirror making service is that no matter what type of mirror you want and no matter where you want it, we can help you achieve a mirror design that meets your exact design specifications. Splashbacks of Distinction not only make fantastic made to measure mirrors, we provide our customers with a customer service that is second to none. Why do we love mirrors so much? A mirror is not just a utilitarian object that is there solely to check ones appearance. A mirror is also great way to add light and luxury to any wall and they are the best way to make a small space look and feel much larger. As furniture goes, a mirror is one of the less expensive pieces of furniture that you can buy for your home or office. Many home design professionals claim that a mirror completes the look of any room. There are many types of mirror, ordinary mirrors, oversized mirrors, frameless mirrors, and purely decorative mirrors. The choice is huge, but rest assured, there is a mirror design to suit every taste. Bespoke mirrors create the illusion of space. A well appointed mirror can help give the appearance of more space in a room. The mirror reflects the room, making you think that it is larger than it actually is. A small, narrow room can benefit from hanging a wall mirror, or you can even place a large mirror to make the room look spacious. A mirror in a narrow hallway or a tiny bathroom will make these small areas look more expansive. 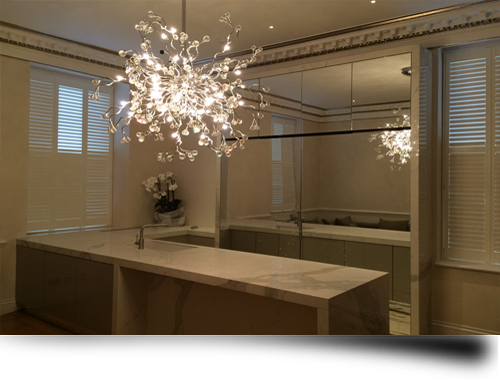 Bespoke mirrors increase lighting. A mirror will reflect light from natural sunlight as well as from artificial sources such as lamps and candles. The more natural light that comes into a room with mirrors the better, as you won't feel the need to turn on the lights to see clearly. When mirrors generate this extra light, it makes the room airy, and the more visible a room, the more spacious it looks and feels. You can also save money on electricity as you will use artificial lighting less often. A strong darkly coloured framed mirror creates a definite focal point in any room. The eye will be drawn to the mirror on entering the room. A light coloured frame tends to provide less focus than the darker framed mirror. Bespoke mirrors are great at hiding imperfections on walls. Walls are rarely perfectly smooth! The plaster may crack in places and a previous hole that has been filled with filler tends to show up quite badly when decorated. If a wall in your home has an unsightly area such as a filled hole, crack or discoloured paint, just hang a mirror there and it immediately hides the imperfection. Bespoke mirrors really can make a statement in a room. A large mirror can be a wonderful accent piece in a room. Put a decorative mirror in a room that needs attention. You can use a mirror with ornate carvings, a full length mirror, or an oversize mirror for a great impact. The mirror will immediately brighten the room and create a nice focal point too. Use a mirror to modernise the look of a room, or to bring interest in a space. Last but not least, bespoke mirrors are very practical. A mirror will always have it's functional use. Doing your hair, checking your general appearance and applying makeup. What would we do without them? Because our mirrors are bespoke, they are completely unique to you. So whether you want a mirror for an awkward space that no off the shelf mirror will fit, or want a huge wall sized mirror to make a big style statement, you can rely on Splashbacks of Distinction to meet your needs. Why not ask us about our outdoor mirrors? Splashbacks of Distinction are happy to discuss the production of garden and outdoor mirrors. These mirrors are weather proofed so they will last through all the seasons of the year.